Refugees moving to a refugee camp (file photo). The South Sudan government is expected to appear before the East African Court of Justice (EACJ) in a case where it is accused of arbitrary arrest and detention of a prominent businessman. According to lawyers representing Mr Kerbino Wol Agok, agents from the National Security Service arrested him on April 27, 2018 and have kept him in detention since, without charging him. "The EACJ has issued summons to the Minister of Justice of the Government of South Sudan to appear before it on March 25, 2019 in the case of prominent South Sudanese businessman and philanthropist, Kerbino Wol Agok," reads a statement signed by Mr Emeka Obegolu, the president of Pan-African Lawyers Union (Palu). Mr Obegolu said the continental lawyers' lobby was approached by associates of Mr Agok last year after he was denied access to his lawyer as well as medical care. "Palu therefore filed the case, being Reference No. 19 of 2018, on October 12, 2018. In the Reference, Palu complains about the prolonged, arbitrary detention of Mr Agok, without being informed of reasons for his arrest, without being charged or brought before a competent impartial Court or tribunal," Mr Obegolu says. The lawyers said the government froze Mr Agok's commercial and personal bank accounts and closed several of his businesses. Palu seeks "the Court to declare that Mr Agok's rights have been violated; to order his release; to order the reopening of his businesses and the return of his money; and that Kerbino be compensated by way of reparations and damages." Amnesty International welcomed the summons saying it "offered a ray of hope for the people of South Sudan who have endured seemingly endless human rights violations and abuses'. "This court decision could open up a much-needed alternative pathway for justice for victims of human rights violations in South Sudan because the national justice system has failed dismally," said Seif Magango, Amnesty's Deputy Director for East Africa, the Horn and the Great Lakes. She also added that the case would serve as a wake up call for Juba to reform its justice system. It is the first time ever that the South Sudan government has been taken to the regional court for rights violations. Last month, the Catholic Bishops claimed that there were still several political detainees in various detention centers across South Sudan despite a presidential pardon. UN experts have also expressed concern over Juba brutal crackdown of critics. Juba intensified crackdown on government critics in 2013 after President Salva Kiir accused his then deputy Riek Machar of plotting a coup. 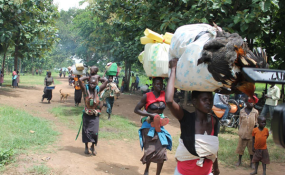 The civil war has displaced over 1 million people to neighbouring counties with seven million South Sudanese are in need of food and humanitarian assistance.